We study the cellular and molecular mechanisms underlying animal development, and how these mechanisms can influence evolutionary change. We focus on embryos of molluscs and related animals, because of their large accessible cells, invariant cleavage patterns, informative phylogenetic position in the animal kingdom, and (of course!) their intrinsic beauty. Molluscs are representatives of a large clade of protostome phyla--the Lophotrochozoa--where molecular mechanisms of development are poorly understood. In addition, molluscs typify spiral cleavage, a dominant mode of early development in multiple protostome phyla and a developmental trait with an interesting evolutionary history. These embryos are amenable to a variety of classical embryological manipulations, allowing functional tests of hypotheses about patterning mechanisms. We are pursuing questions about several aspects of early patterning in the snail Ilyanassa, from the mechanisms of asymmetric cell division to signaling by the molluscan embryonic organizer. Our findings are providing new insights into the diversity of developmental mechanisms found in animals, as well as a clearer picture of how such processes evolve. mRNAs for developmental patterning genes are localized to specific centrosomes during early cleavages in Ilyanassa. Eight cell embryo, stained for DNA (blue), microtubules (green) and IoDpp mRNA (red). Early cleavages in spiralian embryos are often asymmetric, so that the daughter cells of a division differ in size and developmental fate. We discovered a novel mechanism for segregation of patterning molecules during asymmetric cell divisions. mRNAs of multiple developmental patterning genes are localized to particular centrosomes before they are segregated to specific daughter cells during division. We think this mechanism patterns the animal-vegetal axis of the embryo, by determining the developmental potential of tiers of cells as they are born. Many questions remain about this phenomenon, including what proportion and classes of mRNAs are localized to centrosomes, the mechanism of localization, and the developmental roles of localized patterning molecules. MAPK activation in the 3D nucleus (blue, lower right) precedes signaling from that cell to overlying cells to specify cell fates along the dorsal-ventral axis. 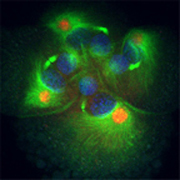 Cell boundaries are red, and nuclei are green. Classical embryological experiments have indicated that normal patterning in spiralian embryos requires induction of multiple cell fates by a cell known as the organizer. We previously demonstrated that this organizer signals via the MAPK pathway. We now have evidence that there is a parallel signal from the organizer mediated by the Dpp/BMP2&4 pathway. This signal appears to pattern the head, including positioning the eyes. This work has implications for the evolution of animal body plans. The axis inversion hypothesis holds that there has been an actual inversion in the dorsal-ventral axis during animal evolution, and the roles of Dpp/BMP2&4 pathway in flies and vertebrates have been used to support this. The role of the pathway in Lophotrochozoans is unknown and will be a key test of this hypothesis. We have begun to extend our work in Ilyanassa to other molluscs and related phyla. In three other molluscs and one annelid, MAPK signaling is involved in DV axis specification and organizer function, but differs significantly from its role in Ilyanassa. This is the first known commonality in the molecular mechanisms of patterning among spiralian embryos from different phyla. We will continue to examine the distribution of patterning mechanisms across spiralian and lophophorate taxa. Far left: MAPK activation (brown) in the organizer cell of a chiton embryo. 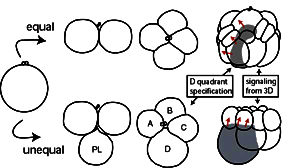 Left: the specification of the D quadrant in spiralians can occur by cellular interactions as in equal cleavers, or by asymmetric cell division as in unequal cleavers. The evolution of gene regulatory activities is predicted to be an important mode of phenotypic evolution. We have been working on a project that is examining the functional relevance of gene expression evolution. This project allows genetic and genomic analyses and represents a possible bridge between microevolutionary processes and the evolution of a large-scale phenotypic change. We are studying the resistance of the fruit fly Drosophila sechellia to a plant toxin that is lethal for all related flies. The toxin, octanoic acid, is a major component of the fruit of Morinda citrifolia, and the evolution of resistance mechanisms has apparently allowed D. sechellia to occupy a new ecological niche. 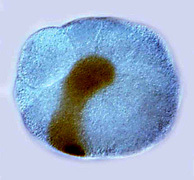 Unlike its closest relatives that are generalists, D. sechellia has specialized on the Morinda fruit, where it prefers to mate and lay its eggs. We are using this system, and genomic resources from D. melanogaster, to measure the evolution of gene expression patterns between D. sechellia and D. simulans. We are then testing the phenotypic effects of these gene expression changes by constructing transgenic D. simulans. Rabinowitz, J. S., Chan, X. Y., Kingsley, E. P., Duan, Y. and Lambert, J. D.2008. Nanos Is Required in Somatic Blast Cell Lineages in the Posterior of a Mollusk Embryo.Current Biology(18): 331-336. Swartz, S. Z., Chan, X. Y. and Lambert, J. D.2008. Localization of Vasa mRNA during early cleavage of the snail Ilyanassa.Development Genes and Evolution218(2): 107-13. 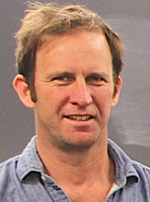 Lambert, J. D.2008. Mesoderm in spiralians: the organizer and the 4d cell.Developmental Evolution310B: 15-23. Kingsley, E. P., Chan, X. Y., Duan, Y. and Lambert, J. D.2007. Widespread RNA segregation in a spiralian embryo.Evolution & Development9: 527-539. Lambert, J.D. and L.M. Nagy.2003. 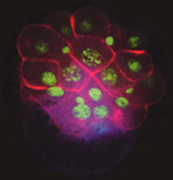 The MAPK cascade in equally cleaving spiralian embryos.Dev. Biol.263: 231-241. Lambert, J.D. and L.M. Nagy.2002. Asymmetric inheritance of centrosomally localized mRNAs during embryonic cleavages.Nature420: 682-686. Lambert, J.D. and L.M. Nagy.2001. MAPK signaling by the D quadrant embryonic organizer in Ilyanassa obsoleta.Development128(1): 45-56. Lambert, J.D. and N.A. Moran.1998. Deleterious mutations destabilize ribosomal RNA in endosymbiotic bacteria.Proc. Natl. Acad. Sci. USA95: 4458-4462.